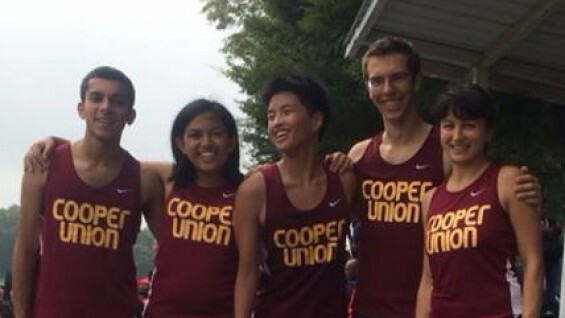 On Sunday, September 21, 2014, five athletes from Cooper Union’s Cross Country team attended York College’s Women’s 6K and Men’s 8K at Van Cortlandt Park. Races at Van Cortlandt Park are often considered a “baptism by fire” for new runners, and a formidable challenge for even the most hardened athletes. The sharp grades, juxtaposed with long stretches across a field, ensure that only the most versatile runner can come out on top. Despite the odds, Scott Kulm (ChE‘17) finished first out of a set of fifty-one collegiate runners! By the end of the eight kilometers, Scott crossed the finish line with a fantastic time of 28:55; a full minute quicker than the next finisher. While Scott was one of the front-runners early in the race, jackrabbits aside, and was able to maintain a sub-six-minute mile pace for almost half an hour, in spite of the steep hills and physiologically challenging terrain. Scott’s first place finish was flanked by strong performances by Loretta Barrera (AR’15) and first-time runner Anna Jozelle Lomboy (ChE‘18) in the women’s 6K, as well as Peter Wang (CE’16) and Sohan Mone (CE’16) for the men’s 8K.